Smarties, we bring you another fresh Father’s Day gift idea – how about a chance for your hubby to pick out something great for themselves? Do they like to fish, hunt, or just want something nice to wear to dinner? The Sporting Gent has something for every man, dad, brother, father-in-law, grandpa. (you get my point) There selection is wide and different than many stores. Your sporting gent will love what they see. He’ll think this is the B-E-S-T Father’s Day ever! Located on the side of the historic Colony Shopping Center in the Myers Park neighborhood of Charlotte, North Carolina, The Sporting Gent is a gentleman’s clothier and outfitter displaying a selection of fine outdoor and casual brands including Beretta, Southern Marsh, High Cotton Ties, State Traditions, Drake Waterfowl, Filson, Rodd & Gunn, Hardy Fly Fishing and Sebago Footwear. Their mission is as simple as it is classic: to preserve and support the true gentleman, from the field to the dinner table. 2. Make sure you are following CSP and The Sporting Gent on Facebook. Let us know that you are in the comment section below. 3. Check out the list of brands that The Sporting Gent carries and let us know in the comment section below what you’re thinking your hubby will buy with his $50 gift certificiate. That’s it! Winner will be announced in our newsletter Friday, June 13. Just in time for Father’s Day! Good luck! If you want to pop by The Sporting Gent to see their awesome selection, here’s all the info you need. Tell them CSP sent you! I follow CSP and The Sporting Gent. My husband loves this store!! He will probably pick out a Southern Marsh shirt! Thank you!! Follow both CSP and The Sporting Gent! My husband would probably use his GC and get a pair of Sebago shoes. I am following both on facebook. I got my husband a Southern Marsh shirt for Christmas and he has worn it to bits. Would love a new one – I have done nothing to prepare for Father’s Day!! Following CSP & Sporting Gent on FB. I’m guessing my hubby would buy an Over Under long sleeve t.
This is my husband’s new favorite store!! Followed both since the beginning! Love Sporting Gent and CSP! Follow both and plan to buy Father’s day prezzies there! Best Men’s Store in Charlotte, welcome to CSP Sporting Gent! Southern Proper! We have a black lab who wears a red collar so he definitely needs some Southern Proper! Follow both on FB. And we love Marc’s shop! Southern Marsh collared shirt is what my husband would love! Following both on FB as MunchTalk! I think my husband would like Fulton and Roark! I love the fact that there is a store like this in Charlotte. 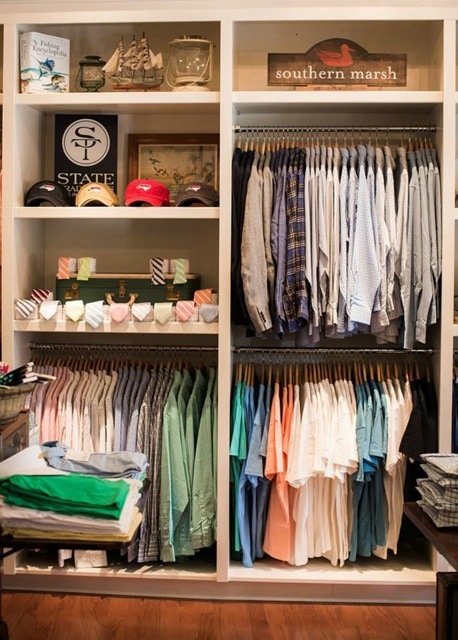 We cannot wait to go to this store! I have “like” CSP for a long time and I just “like” The Sporting Gent store. I think my husband would like Southern Marsh or High Cotton, but I’m sure there is a lot more he’d love. This is his kind of store!!!! Following both! My husband has never been, but buying/shopping for himself is rare, so I know he would be excited to have the gift certificate to spend. My husband would probably get a pair of sebago shoes. Great giveaway! Following both! My husband needs to bulk up his wardrobe in a lot of ways, so it’s hard to say what he would choose, but I’m guessing maybe a High Cotton tie. Lots of incredible options at this store! This store looks great, we’ll have to go visit. My husband would probably put it towards a new yeti cooler. Following both! My husband never shops for himself, so I’d be so happy for him to have anything in the store. It all looks so stylish!